Glucosamine is naturally produced in the body and is a key component of cartilage, which is essential for normal joint function. Taking glucosamine as a supplement has been shown to be as effective as some drugs for the relief of symptoms associated with degenerative joint conditions such as osteoarthritis. 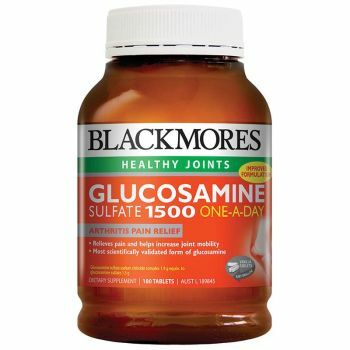 Blackmores Glucosamine 1500 is a high potency supplement that has been specifically formulated to provide a clinically proven dose of glucosamine for effective arthritis pain relief in a convenient one a day tablet.